Nicolas Bechtel Photos, News, and Videos | Just Jared Jr.
Jenna Ortega is saying goodbye to her character Harley Diaz. The 15-year-old Stuck In The Middle actress shared her thanks for the memories and experiences she’s had from being on the show. “Thank you for the beautiful quinceañera, the memories and experiences @disneychannel but most of all thank you for trusting me and allowing me to live out my childhood dream. You’ve changed my life forever and I am eternally grateful,” she wrote on Instagram. “Thanks to all of the people behind the scenes who made this possible and worked so hard at bringing this show to life. To my Diaz family, I’ll love you all forever. To all of the fans, I thank you for all the love, support, posts, and edits, but most of all for allowing the Diaz family into your homes. It’s really been an honor to be part of your childhood memories and I’m glad we made you smile. I’ll love you all forever and hope you all love the series finale of #stuckinthemiddle tonight at 8:30pm on @disneychannel 💛” Jenna added. Get your tissues ready, the Diaz family is saying goodbye as Stuck In The Middle‘s final episode airs in just a few hours! 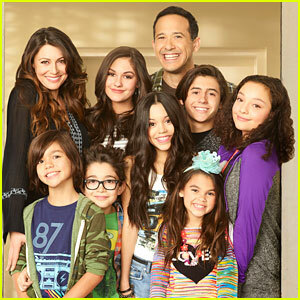 The Disney Channel series, starring Jenna Ortega, Isaak Presley, Kayla Maisonet, Ariana Greenblatt, Nicolas Bechtel, Malachi Barton, and more, has been on air since February 2016 and is coming to an end after three seasons. The Stuck In The Middle series finale airs TONIGHT (July 23) at 8:30 EDT on Disney Channel! Just before the weekend hit, we were saddened by the news that Stuck in the Middle wouldn’t be coming back for a fourth season. Jenna Ortega shared an emotional speech to all her fans earlier, and her on-screen family Isaak Presley, Ariana Greenblatt, Nicolas Bechtel and Joe P. Nieves followed suit. 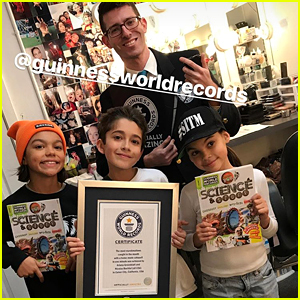 'Stuck In The Middle' Stars Malachi Barton, Nicolas Bechtel & Ariana Greenblatt Break World Records! Congrats to Malachi Barton, Nicolas Bechtel and Ariana Greenblatt — the Stuck in the Middle stars are all now world record holders! The three youngest actors on the Disney Channel program attempted to break a few records with their science teacher on the set this week, and they did it! Malachi broke the most pencils struck through a water filled bag in a minute record, while Nicolas and Ariana broke the the most marshmallows caught in mouth with homemade catapult in one minute record. Their records were recorded by Guinness World Records. Congrats to Ariana, Nicolas and Malachi! Ronni Hawk's 'Stuck in the Middle' Co-Stars Send Her Sweet Birthday Wishes! 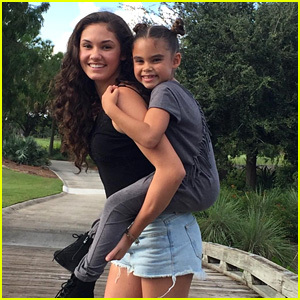 Happy 18th birthday, Ronni Hawk! The Stuck in the Middle actress has been getting so much love from her Disney Channel co-stars today. “Happy Happy Birthday to my fellow Floridian and big sister @ronnihawk,” Ariana Greenblatt captioned the cute Instagram photo below, along with lots of unicorn and kissing face emojis. 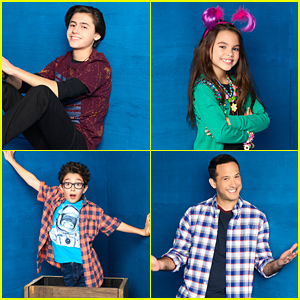 Their other co-stars Malachi Barton, Nicolas Bechtel, and Cerina Vincent shared their birthday tributes as well. Check out all of their photos and messages below!